Design and travel envy ahead. A well-designed interior is more than just that—it’s an experience. This is certainly true when it comes to dining out. The way a restaurant is thoughtfully designed has the ability to dictate the course of a culinary venture. Dramatic or ambient lighting invites an intimate element whereas a space decked with an abundance of greens can evoke the essence of summer, even in the coldest locales. That said, in addition to setting the backdrop for an unforgettable meal, a beautifully designed restaurant can invite a fresh perspective on how we approach the decorative direction of our own homes. It’s not so farfetched—these spaces can urge us to embrace a daring color pairing or an all-encompassing panoramic wallpaper that will evoke a truly wow-worthy detail. With that in mind, we turned to the best new restaurant openings across the globe to source a major dose of inspiration for that much-needed refresh. Here are the unexpected design lessons we learned. This chic London-based eatery takes on the trending palette of earthy neutrals with a fierce vision. The liberal layers of warm tones and pops of terra-cotta are subtly offset by cool blues—an ode to the Mediterranean, no less—and elevated with lustrous brass detailing throughout. Brookyln’s Di an Di is a nod to the endless summer we all deserve. Its all-white interior is paired with an abundant array of greens, beautifully planted in woven baskets and placed within nearly every square inch of the restaurant. But the key difference that sets this one apart from the rest is the streamlined approach to the decor that takes the form of a Scandi-cool vibe. Kaikaya is the sort of place that’ll make even the most headstrong minimalist forget about their aversion to color. The plant-filled haven may be a boho-maximalist’s dream, but it’s the intricate pink and red color-blocked tiling that gives the retro trend its contemporary edge. We’re all for emulating this tile design in the powder room for a showstopping effect. Creative paint techniques (think stamp tools or tonal layers) invite a breath of fresh air to an otherwise neutral scheme. Allow this beautifully serene eatery to act as your guide for avoiding a one-dimensional finish, which tends to result from a lack of color. With the help of the sleek, minimalist pendants and the cane detailing of the seats, the modest approach to the room’s furnishings is instantly offset by the intricacies of the designs of the pieces themselves. Leave it to Ken Fulk to give us yet another reason to love pastel pink. The designer’s latest venture can be found in the heart of Miami’s Design District, boasting Fulk’s iconic elegant flair and affinity for the allure of the ’20s. The eatery is a color story in itself—while the main room comprises a blush-toned scheme with subtle odes to the tropics, the theme is further carried out by lush palm-printed wallpaper in the bathrooms and a similarly decked outdoor area. There is something to be said of a moody interior outfitted in a wall-to-wall concrete finish and decked with a plush array of saturated velvet upholstery. Emulate this palette in the dining room by pairing a stained wood table with jewel-toned chairs for an effortlessly cool and elegant finish. 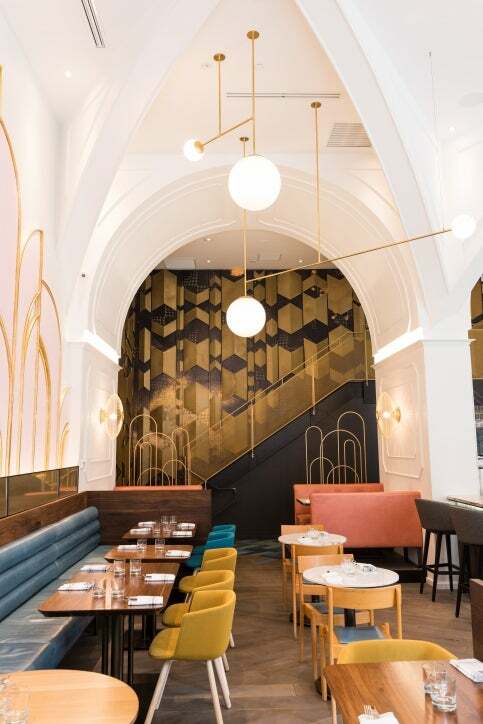 There is no denying the influence of Art Deco in the current design scene, but the key difference lies within the contemporary form it has taken—the decorative direction of this Toronto hot spot is simply proof. Here, the familiar motifs of the era are reimagined in vibrant colorways with a creative integration of metallic details that come to double as artful accents in their own right.